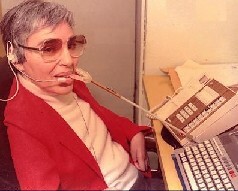 Doris Brennan was the Executive Director of Linking Employment, Abilities and Potential (LEAP), A Center for Independent Living, from 1986 until her passing in 2000. In 1988 Doris became the first Ohioan named to the National Hall of Fame for Persons with Disabilities and also received the E.B. Whitten Silver Medallion Award of the National Rehabilitation Association. She was also given the Ohio Rehabilitation Association’s Bell Greve award. In 2000, she was named a “diversity champion” by the Greater Cleveland Roundtable and National Conference for Community and Justice. 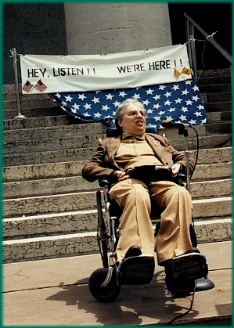 As a pioneer in the field of disability rights and independent living, Doris traveled throughout the country as an advocate and speaker, encouraging others to find their voice. The article below is comprised of excerpts from over a dozen presentations she gave. Interspersed with her words are my reflections on the successes we have seen and the challenges we still face in creating justice for people with disabilities. My name is Doris Brennan. I’m thinking back to the onset of my disability. It was 1954, I was 20 years old. I was in an automobile accident, and in a blink of an eye, my life was changed. I broke my neck, severing my spinal cord. I lost the use of both my arms and my legs. My paralysis started at the level of my shoulders. I had become permanently and totally paralyzed. At the time of this writing I am 62 years old. I look at my current life, and I find that I am more active that I have even been. My creative juices are flowing as well as, or better than before. Juggling several projects at a time is a daily routine that, so far, hasn’t overwhelmed me. My work is satisfying. Five months after the accident I had been weaned off the iron lung, but not much else had changed in my living situation or in the medical prognostication of my limited future here on Earth. My stay at the Rehabilitation Hospital lasted 2 ½ years. My time in the Rehab Hospital was filled with encounters with other people with similar disabilities, at varying levels of rehabilitation. There was camaraderie among those of us who were younger and who had spinal cord injuries. There was a sense that we needed to help each other and encourage each other. The feeling was almost familial. As my time in the hospital extended I became part of the greeter and encouragers for the newer spinal cord patients. Our families, too, were drawn into the helping arena. I know my mother was often called upon by parents of newly injured quadriplegics for guidance and reassurance. A sympathetic ear, a sense of understanding, similarity of circumstances and most importantly, experience coping were the key element of the bonding that occurred among spinal cord injured people and their families. My friends in Occupational Therapy looked into their mixed bags of devices and technological hardware (embryonic though it was) and found ways for me to use splints with attachments to feed myself, type, play games, work with ceramic tiles, and most importantly, put on my lipstick. (Only someone who has gone through the ordeal of having lipstick applied by an array of nurses and aides who “can’t color inside the lines” will understand the magnitude of this last achievement!) My dentist friends came up with a wondrous mouthstick which enabled me to turn pages, dial phones, paint and type… Accomplishments added to my validation as a person and became the building blocks of my ever-improving self-esteem. Whenever I talked about what I would do after I got out of the hospital, there would be a lot of smiles among the social work and psychology departments, but no encouragement or suggested avenues I might pursue. I wanted to go to school, but there was no money, no transportation, and no personal assistant services to facilitate furthering my education in pursuit of a new career path. In the late ‘50’s and early ‘60’s, vocational rehabilitation programs were not providing services to quadriplegics because they didn’t feel the investment of time and money was practical since we were probably not going to live long enough to make the investment pay off. I became involved in the Spinal Cord Injury Association as an advocate and activist focusing on making the community around us more welcoming to all people with disabilities. In the mid 1960’s we approached Cleveland City Hall to promote and request curb cuts to make it easier for people with disabilities to get around the city, we were thought to be crazy radicals, asking for the moon. The ridicule and the haranguing we received from Council and the Mayor and radio talk people was horrendous… Civil rights for people with disabilities was not even thought of, and discrimination, blatant as it was, was the expected norm. As my involvement with the Spinal Cord Injury Association grew, so did my activism. Because we were the only disability group around, our phone numbers were the ones to call for information about disability-related concerns. We were called on to assist families of people who had recently became spinal cord injured and to provide peer guidance to the disabled person; to provide information about equipment and adaptive devices; to locate accessible, affordable housing; to inquire about the possibility of paid in-home attendant services; to find out about travel needs; to ask about job opportunities; to locate transportation for wheelchair users that didn’t cost an arm and a leg. The list of things we were called for covered the full scope of life circumstances and situations of people with disabilities and their families. Although we were able to assist many of the people who sought our help, frustrations kept mounting about the vital areas of concern we could not help. Accessible, affordable housing was almost non-existent in the Cleveland area, and Ohio had no paid in-home attendant services. Transportation options consisted of ambulances and private transportation that costs $50.00 a round trip, and employment opportunities for people with disabilities were few and far between. Certified Information and Referral practitioners answer approximately 28 million inquiries a year about community, social and health services. (7) Despite decades of activism and policies to address equal access and full participation, the barriers people with disabilities face today are the same as they were 50 years ago: access to accessible, affordable transportation; access to accessible, affordable and safe housing; access to health care; access to assistive and adaptive aids and devices; access to income supports; access to skilled personal care assistants; and opportunities for community living and jobs. As we moved toward the 70’s and observed the changes being wrought in society by the civil rights movement and the women’s movement, people with disabilities began to seek their own “day in the sun.” The disability rights movement began to take shape. Many of us in the Greater Cleveland Area were involved in advocacy and activism to improve life and to provide opportunities for inclusion in all aspects of society for people with disabilities. And inch by inch, curb cut by curb cut, and ramp by ramp we began to make a difference. I found that as I became a more active, participating person, my health seemed to improve….My first job, after disability, was a home-based job as a Scheduler of Nurses to staff the Red Cross Blood Units. I worked for them for about 6 years, and really felt good about doing something productive. Finally, the first chinks that appeared in the wall of discrimination were the amendments to the Rehabilitation Act in 1978. For the first time people with disabilities had some protection against discriminatory actions in employment and public accommodations through Section 503 and Section 504 of the Rehab Act. Our new role as advocates now had some teeth in it, and we in the greater Cleveland area were ready and willing to establish an independent living center in Ohio to generate service and advocacy geared toward including people with disabilities in the life of our society. Ohio’s Centers for Independent Living (CILs) help individuals with disabilities live independently. People that CILs serve include those with physical, intellectual, sensory (hearing and vision loss), neurological, and mental health disabilities; as well as disease-based disabilities including (but not limited to) cancer, diabetes, heart conditions, mobility issues, dementia, and Alzheimer’s. All of the CIL’s activities occur within the guiding principles of consumer control (at least 51% of board and staff members have a disability), peer support, self-help, equal access, self-determination, and individual and systems advocacy. CILs are a vital one-stop resource that help individuals with disabilities address barriers that prevent full inclusion in their communities. Services include accessible housing and transportation, employment, personal care assistance, peer support, socialization and recreation, application and enrollment in public benefits, access to affordable health care and medical supports, home modifications and ramps, reintegration from nursing home to the community, and diversion and prevention services to keep individuals from entering into an institutional living situation. My first full-time job, at the age of 47, was at the first Center for Independent Living in Ohio, which I helped establish. It proved to me that I could work in the community, doing something significant that would bring about change in our society that would affect the lives of hundreds of people with disabilities. The following 15 years have been filled with advocacy and services, which fostered change in the community and change in the state that opened the way to improve options for citizens with disabilities in Ohio. 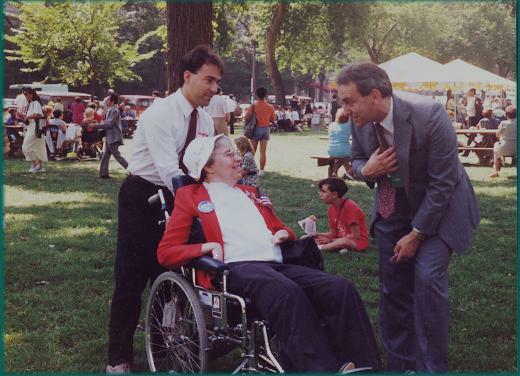 I was proud to be a part of the Ohio contingent who were present for the signing of the Americans with Disabilities Act on the front lawn of the White House on July 26, 1990. People with disabilities, through the stroke of a pen, gained their civil rights. etched in my memory is the joy, exhilaration and camaraderie of everyone there. The White House Lawn, under a scorching sun, was a sea of humanity representing people of every walk of life from across the country, disabled and non-disabled alike. They come together to witness and celebrate the emancipation of Americans with disabilities. As President Bush signed historic Americans with Disabilities Act into law of the land, there were whoops, hollers, and tears of joy. It was an electric moment that will remain with me forever. This moment in history did not “just happen.” That moment in history, exhilarating as it was, has a whole epoch behind it-an epoch that spanned over 40 years. An epoch fraught with obstacles, barriers and divisiveness and buoyed by hope, determination and unity. Explore how nearly 29 Years after the ADA, “People with Disabilities Have Come a Long Way, but the Fight Isn’t Over:” https://themighty.com/2018/07/american-with-disabilities-act-history/. People with disabilities constitute our nation’s largest minority. Numbering an estimated 43 million, Americans with disabilities are a vast, untapped human resource. Some of us may have difficulty walking, talking, hearing or seeing: some of us may think or learn differently, but those very differences can be diversities that enrich us all. We have talents, gifts, skills, and abilities waiting to be tapped. Through the enactment of the ADA, doors of opportunity have been open, and we stand ready to enter those doors and share our strengths, abilities and productivity with our fellow citizens in quest of a better life for all of us. Providing independent living services is much less expensive than paying for individuals to live in institutions. It costs on average more than $75,000 per year for a person to live in a semi-private nursing home room. A person can be provided IL services so he or she can live independently in a house or in an apartment for $35,000 a year, saving the state $40,000 per person. Our return on investment is excellent and a small increase in state funding is a big investment in helping all Ohioans live, learn, work, and play in the community of their choice. I also volunteer with many state and local organizations that promote improved life options for people with disabilities and other people for whom life is often difficult and disadvantaged. I enjoy music and dance, and try to go to performances of the Opera and Ballet whenever I can. I also enjoy listening to music–all kinds of music. I read a lot. I keep up with the politics of the day. I enjoy cooking shows and recipe books and I like to have new taste opportunities by having my family try out new recipes… Independence and the ability to pick and choose activities I want to be part of make the difference between “living” and just subsisting. I suppose my close-knit family and their unflinching support, understanding, and acceptance gave me a real sense of my value and worth as a person and as an integral member of my family. I was never made to feel that I was a burden or that because of my disability should revert to being treated like a child. My life was mine to direct. Decisions about my life were mine to make, and right or wrong, I was allowed the freedom to make choices about my life. Social determinants of health are conditions in the environments in which people are born, live, learn, work, play, worship, and age that affect a wide range of health, functioning, and quality-of-life outcomes and risks. (8) Doris’ quality of life was directly related to her ability to engage with family and community, have productive work, and enjoy leisure activities. As we all know, there is much yet to be done to assure the true integration of citizens with disabilities in all aspects of our society. I will continue to advocate with and for my peers to help bring about changes in attitudes and in the environment which will lead to full participation in every facet of life and which will guarantee that we are not “on the outside, looking in” when it comes to jobs, education, transportation, commerce recreation, the arts, religion and family life! An intern at the rehab hospital in 1957 told Doris’ mother “There’s a lot she can do without the use of her hands”. Indeed, it was her voice that helped bring civil rights to the millions of people with disabilities in our country. We too must raise our voice for justice. Disability is a natural part of the human experience and in no way diminishes the rights of family members, friends, neighbors and co-workers to make choices, live Independently, pursue meaningful careers, contribute to society and enjoy full inclusion and integration in the economic, political, social, cultural, and educational mainstream of American society. Predicting life satisfaction among adults with physical disabilities; Kinney, Coyle CP. Temple University, Philadelphia, PA 19122. National Spinal Cord Injury Statistical Center, Facts and Figures at a Glance. Birmingham, AL: University of Alabama at Birmingham, 2015.